I saw the sickest thing on House last night and I can't stop thinking about it. It was so gross and I hate it. The episode started with a scene on a slave ship from the olden days where everyone has small pox so they sink the ship to contain it. Flash to present day when some scuba divers find an old jar full of these blackish brownish jagged things. I was horrified. Are those big germs in the jar? I wondered. Fossilized germs? What could it be! It's hundreds of years old--what is it? "It looks like feathers," the divers said. Sick. Guess what it was? Scabs. The do-it-yourself-immunizations of the 1700s. Gag. I am seriously gagging right now and trying to stop myself. I know they weren't real 300-year-old scabs. But that is almost more troubling to me--that a prop designer would conceive of really old preserved scabs as jagged and feathery. What kind of mind would think of that? It's Stephen-King quality and I am slightly impressed but mostly repulsed by it. I deleted it from TIVO immediately because I knew I would be tempted to look at it and pause it and contemplate it. Christian didn't even watch it yet but I had to get rid of it. (He's not that into House this season anyway.) I'm glad I deleted it. The episode also made reference to "viral shedding" which is a concept that also disturbs me and makes me sick. I hate it when things slough off, infect, expel, extrude, or bud. Ohhhh, more gags. It's like barnacles. Or Freaky Sick Crapola. I recently discovered something else that disturbs me deeply: Late-night freeway construction. I've encountered it a few times in the last couple of weeks and I was surprised at how strongly it freaked my out. I really hate the apocalyptic industrialization of it. What else is going on while I'm asleep? It's so organized and well-lit. What if someone evil were in charge? Just think of what they could do during the wee hours. Road construction during the day just seems lazy and inconvenient. It's different at night. It's like someone or something is mobilizing. It creeps me out. And now you know a fraction of my torment. This is how I feel about the Suriname toad. My husband has a thoroughly disgusting infected big toe right now. Oozy and everything! I have to help him by rubbing in the ointment the dr. gave him. It makes my skin crawl and is oddly fascinating all at once. You can come and look at it anytime you want. You should read The Speckled Monster. It is about early attempts at smallpox vaccination, and how it developed concurrently in Europe and America. I really enjoy me some disease history. The Great Mortality was a good one, too- about the plague. Both non-fiction,non-stephen king, and no visuals, feathery or otherwise. But alas, neither is there any Hugh Laurie. Did you see the John Adams miniseries where Abigail and all her children get immunized for smallpox? And where John and Abigail's daughter, is it Nabby?, undergoes cancer surgery? Yikes. What a contrast to my experience of struggling with little ones at the pediatrician! It always feels so emotionally exhausting and yet when I consider what Abigail knew the risks to be when she had her children infected! Now that is courage. And I have one more thing to add to November's thankful list: I'm thankful that I'm trying to keep my children safe from disease in the 2010 United States. I meant to go back and get a good look at those scabs, but I forgot. I was really grossed out when I found out they were SCABS! I don't like to go back and look at gross stuff, it doesn't tempt me, but I almost threw up when I saw all the puss and rash and started imagining that my arms itched. That freaks me out. Have you ever gone back in episodes past to get a good look at House's leg? Don't answer. I know. I generally like House - on the rare times when I'm watching TV and it is on - but I'm not sure I'd enjoy even thinking about scabs!! "...the apocalyptic industrialization of [late-night freeway construction]..." is quite a profound concept to consider, actually. It's as if one happened across the rare occasion to drive through a clandestine after-hours X-Files episode on the outskirts of reality. And ever notice the lights are pointed at the cars? That makes it harder for us to see who they are. It all does give the impression that something untoward is going on behind the scenes. The timing is significant, because we note that UFOs tend to operate at night. Trying to show off your light show in the daytime just doesn't cut it, extra-terrestrially speaking. The psychology of something being accomplished out of our control while asleep is also interesting in its own right. We can't defend ourselves and are most vulnerable in slumber. Who's there to check on them to keep them in line if everybody's asleep? They've got completely free reign to build whatever it is they want to. Indeed, the overthrow of world governments will likely be orchestrated between the hours of 10pm and 5am. Yuck, yuck, yuck! That's why I have a hard time with medical dramas. They show the truly freaky things of the world. 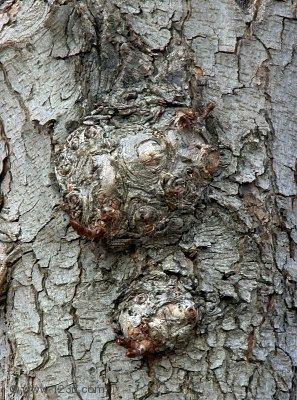 Had to laugh at your picture of protruding bark. Well, I must say you should never read The Hot Zone. A very disturbing non-fiction book about the origins of Ebola and....what happens to people who come in contact with it. dis.turb.ing. Matt loves House. I like it (minus the experimental who-am-I-anyway exploits of the scary-eyed girl "13") but I generally don't watch the intro, I just come in once the opening titles have started (with that cool theme music) and have Matt tell me what happened. Same with Law and Order intros. I can't take the visual grossness. I feel the same way about overnight things. I got the creeps when I had James late at night and the hospital was just hoppin at 1am, just like any other time of day. Sometimes I love late night, but people full-on working, etc...I totally get the creepiness. And don't get me started on bodily functions/fluids/ excretions. Suffice it to say I wil NEVER.EVER. work in the medical or dental profession. Thanks a lot. I WAS enjoying eating a plate of nacho chips until I read your post. Want some chips Richard? Have you watched that huge back zit video yet? You just grossed me out on so many levels! I hate hate HATE barnacles!!!! And I'm so relived to know I'm not the only one! But my phobias don't stop with barnacles, I'm petrified of spawning coral and lotus seed pods. And the worst? Try Googling images of a Surinam toad or a shark's ampullae of Lorenzini. So GROSS!!!! It makes my flesh crawl just thinking about it! Of course, I devoted a whole blog post a while back to all these things. Check it out if you have time and feel like dry heaving! Barnacles are totally gross, I agree. I hate groups of little things all together -- poppy seeds, honeycomb, bumpy rashes, octopus tentacles... All of it, awful. I also hate meat on the bone. Too many tendons and ligaments and things. Chicken wings are the worst.